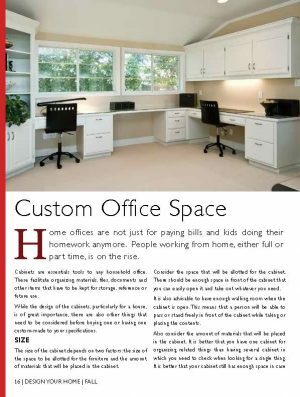 Design Your Home | Articles about home, cottage, apartment or condo living from the interior to the exterior, helping you find local ideas, products and companies that will help you make your living space your home! 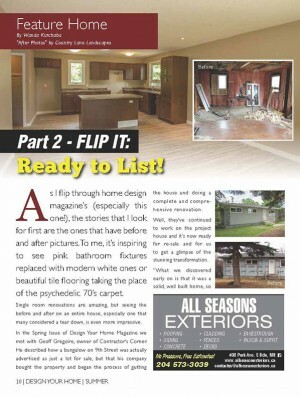 | Feature Home: Part 2 – Flip It: Ready to List! Feature Home: Part 2 – Flip It: Ready to List! 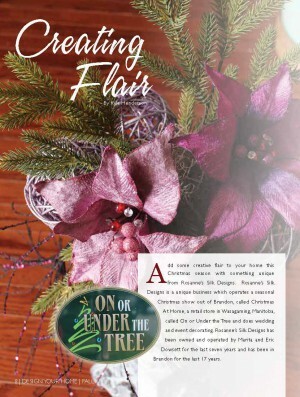 As I flip through home design magazine’s (especially this one! ), the stories that I look for first are the ones that have before and after pictures. To me, it’s inspiring to see pink bathroom fixtures replaced with modern white ones or beautiful tile flooring taking the place of the psychedelic 70’s carpet. Single room renovations are amazing, but seeing the before and after on an entire house, especially one that many considered a tear down, is even more impressive. 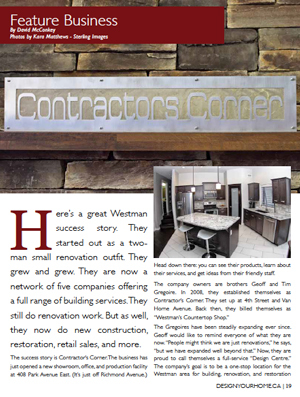 In the Spring Issue of Design Your Home Magazine we met with Geoff Gregoire, owner of Contractor’s Corner. He described how a bungalow on 9th Street was actually advertised as just a lot for sale, but that his company bought the property and began the process of gutting the house and doing a complete and comprehensive renovation. Well, they’ve continued to work on the project house and it’s now ready for re-sale and for us to get a glimpse of the stunning transformation. 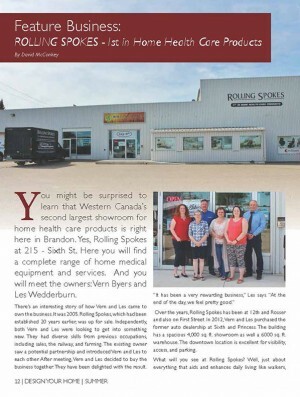 “What we discovered early on is that it was a solid, well built home, so we had lots to work with. It will be great for a young family that is looking for a good, solid home in a very good price range,” said Geoff. The 970 square foot, open-concept house at 834-9th Street has three bedrooms, two bathrooms and a full-sized basement. It was untouched in terms of upgrades and maintenance for a number of years. Water damage from a hole in the roof meant an extensive demolition on the inside of the house with even some rafter and stud replacement. “It’s basically a brand new home. We put in new windows and doors, soffit, fascia, shingles, siding and replaced everything on the interior – all new drywall, insulation, flooring and so on. There’s barely a hint of anything from the original house, aside from the structure itself,” Geoff said. With easy to-care-for, sleek and modern cabinets from Norcraft Cabinetry, granite-like 180fx Formica laminate countertops (Dolce Macchiato 3478) and new lighting/ fixtures, all highlighted by a lovely taupe colour, the renovated home has a warm and pleasant, modern feel to it. “Gray’s have been really popular in the past few years so we decided to switch it up. We gravitated a bit more towards a taupe or brown palette, although we certainly tied the two colours together with the colour in the flooring,” said Geoff. The Solo Click Plank flooring that was installed in the main living area has a cozy and comfortable feel to. It’s a new product from Floored that is easy to install (tongue and groove application), is 100 per cent waterproof, comes in four different colours and is part of the company’s luxury vinyl collection. Brindle was the colour of choice for this project. “It is great for basements and pretty much any room in the house because it’s not made of wood. If it gets wet, you can take it out, let it dry and put it back in,” said Geoff. Other features that add appeal, as well as value to the home include fully tiled bathrooms (tub and shower surround, as well as on the floor) and a unique sun tunnel. The Velux Sun Tunnel provides a soft glow of natural light throughout the kitchen area and is one of the hottest new products on the market that can add a bit of flare to many different areas of the home. Moving to the outside of the property, the exterior was finished in compatible colour palette to the interior with a contemporary, smooth stucco finish, brick highlights (provided by Elite Stone) and finished with a rich vinyl siding. The company also tackled the full basement with a complete renovation. It has a large bedroom, three-piece bathroom, utility room and spacious recreation room, which can be arranged in a number of different ways to meet the needs of a growing family. If you’re interested in more information on this home or to arrange a viewing of this property, call 204-727-3799. *The majority of the products used in the renovation of this home, can be seen at Contractor’s Corner in their design centre gallery at 408 Park Avenue East.